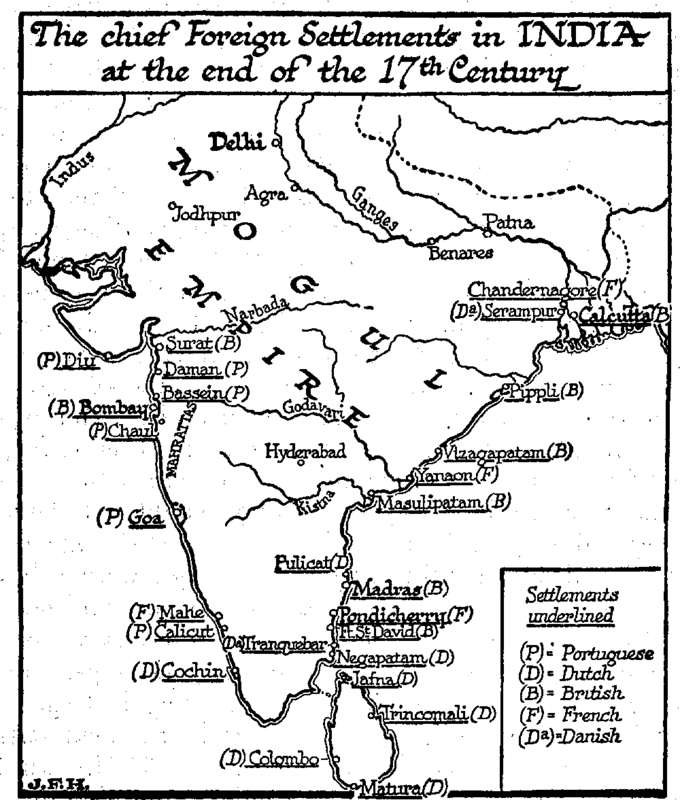 The chief foreign settlements in India at the end of the 17th century. This was the India into which the French and English were thrusting during the eighteenth century. A succession of other European powers had been struggling for a commercial and political footing in India and the east ever since Vasco da Gama had made his memorable voyage round the Cape to Calicut. The sea trade of India had previously been in the hands of the Red Sea Arabs, and the Portuguese won it from them in a series of sea fights. The Portuguese ships were the bigger, and carried a heavier armament. For a time the Portuguese held the Indian trade as their own, and Lisbon outshone Venice as a mart for oriental spices; the seventeenth century, however, saw the Dutch grasping at this monopoly. At the crest of their power the Dutch had settlements at the Cape of Good Hope, they hold Mauritius, they had two establishments in Persia, twelve in India, six in Ceylon, and all over the East Indies they had dotted their fortified stations. But their selfish resolution to exclude traders of any other European nationality forced the Swedes, Danes, French, and English into hostile competition. The first effectual blows at their overseas monopoly were struck in European waters by the victories of Blake, the English republican admiral; and by the opening of the eighteenth century both the, English and French were in vigorous competition with the Dutch for trade and privileges throughout India. At Madras, Bombay, and Calcutta the English established their headquarters; Pondicherry and Chandernagore were the chief French settlements. At first all these European powers came merely as traders and the only establishments they attempted were warehouses; but the unsettled state of the country, and the unscrupulous methods of their rivals, made it natural for them to fortify and arm their settlements, and this armament made them attractive allies of the various warring princes who now divided India, And it was entirely in the spirit of the new European nationalists politics that when the French took one side, the British should take another. The great leader upon the English side was Robert Clive, who was born in 1725, and went to India in 1743. His chief antagonist was Dupleix. The story of this struggle throughout the first half of the eighteenth century is too long and intricate to be told here. By 1761 the British found themselves completely dominant in the Indian peninsula. At Plassey (1757) and at Buxar (1764) their armies gained striking and conclusive victories over the army of Bengal and the army of Oudh. The Great Mogul, nominally their overlord, became in effect their puppet. They levied taxes over great areas; they exacted indemnities for real or fancied opposition. These successes were not gained directly by the forces of the King of England; they were gained by the East India Trading Company, which had been originally at the time of its incorporation under Queen Elizabeth no more than a company of sea adventurers. Step by step they had been forced to raise troops and arm their ships. And now this trading company, with its tradition of gain, found itself dealing not merely in spices and dyes and tea and jewels, but in the revenues and territories of princes and the destinies of India. It had come to buy and sell, and it found itself achieving a tremendous piracy. There was no one to challenge its proceedings. Is it any wonder that its captains and commanders and officials, nay, even its clerks and common soldiers, came back to England loaded with spoils? Men under such circumstances, with a great and wealthy land at their mercy, could not determine what they might or might not do. It was a strange land to them, with a strange sunlight; its brown people were a different race, outside their range of sympathy; its temples and buildings seemed to sustain fantastic standards of behavior. English-men at home were perplexed when presently these generals and officials came back to make dark accusations against each other of extortions and cruelties. Upon Clive Parliament passed a vote of censure. He committed suicide in 1774. In 1788 Warren Hastings, a second great Indian administrator, was impeached and acquitted (1792). It was a strange and unprecedented situation in the world’s history. The English Parliament found itself ruling over a London trading company, which in its turn was dominating an empire far greater and more populous than all the domains of the British crown. To the bulk of the English people India was a remote, fantastic, almost inaccessible land, to which adventurous poor young men went out, to return after many years very rich and very choleric old gentlemen. It was difficult for the English to conceive what the life of these countless brown millions in the eastern sunshine could be. Their imaginations declined the task. India remained romantically unreal. It was impossible for the English, therefore, to exert any effective supervision and control over the company’s proceedings.